Top ten in the Zone 5 Horsemanship Class at the Kentucky National with Zone Chairman Patrick Boyle and Treasurer Pat Haines. 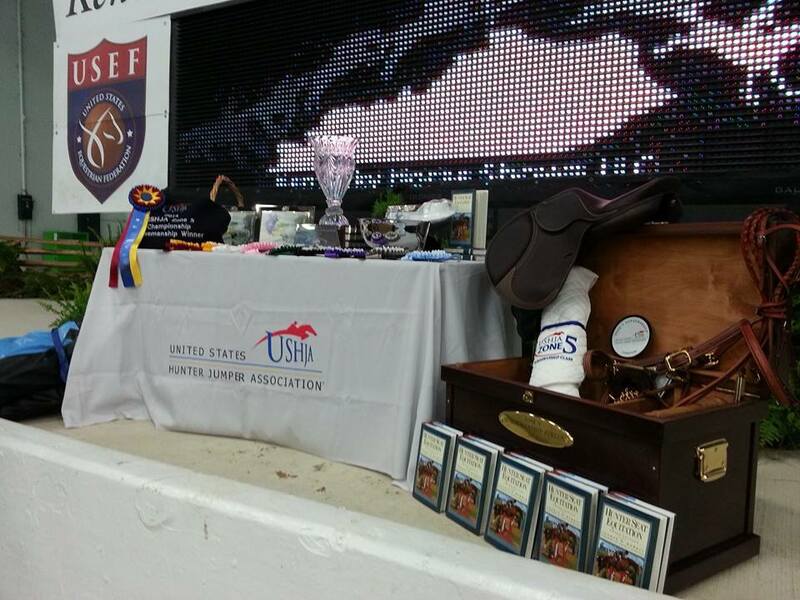 Lexington, KY - September 23, 2014 - The Kentucky Fall Classic Horse Show hosted the Zone 5 Horsemanship class on Friday, September 19th at the Kentucky Horse Park. The special class is for junior members of Zone 5 and was established in 2005 to recognize young riders who place great importance on becoming a well-rounded horseman. The class tests mounted knowledge and skill, as well as the understanding of quality horse care. This three phase equitation class includes a 50 question written exam based on the book, “Hunter Seat Equitation” by George H. Morris, as well as a flat phase and an over fences phase. The over fences phase counts as 50% of the total score with the written and flat phases counting as 25% each. Riders take the test first followed by the jumping phase. All riders then flat and additional testing can be asked of the top four riders at the judges' discretion. Numerous prizes thanks to the many sponsors. Judges Joe and Fran Dotoli assessed the 33 entries, awarding the Perpetual Trophy to Haley Zimmerman, 16, of Carmel, IN. Zimmerman rides with Treesdale Farms and Abby Blankenship. Her horse for the class was San Paolo, a 6 year old Italian Warmblood gelding, who is very forgiving and brave and loves to do his job. "The written test definitely helped me learn," said Zimmerman. 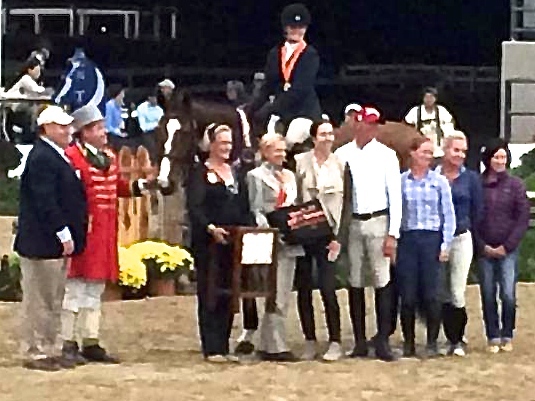 "It encourages each of the riders to read the George Morris book and learn about why we ride the way we do. The jumping phase was difficult because of the many related distances and bending lines, but my horse has a lengthy stride so I knew that if I just trusted him to get me there, he would. The whole experience was hard work, but it definitely paid off in the end, which wouldn’t be possible without the many supporters and sponsors of this event." The Zone 5 scholarship honors Mindy Darst. 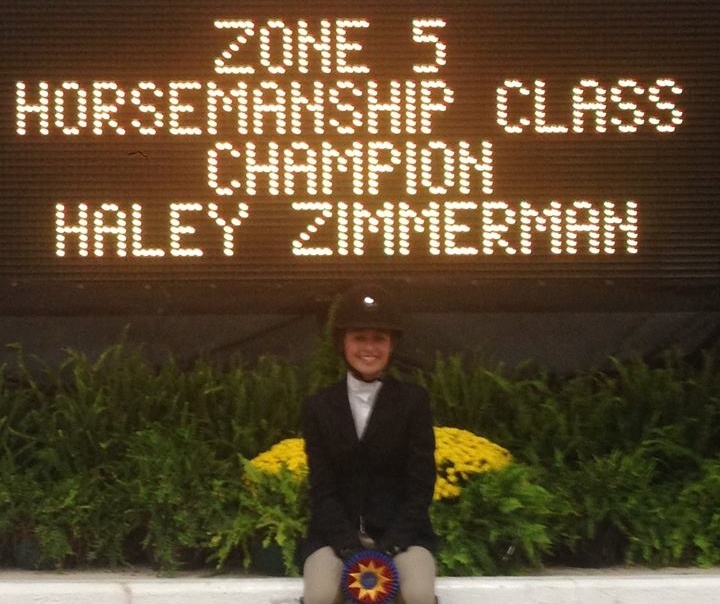 In addition to the Horsemanship Class, Zone 5 offers a $10,000 scholarship each year. Applicants submit an essay and the committee selects a qualified candidate based on the content of the essays and involvement in the horse industry. 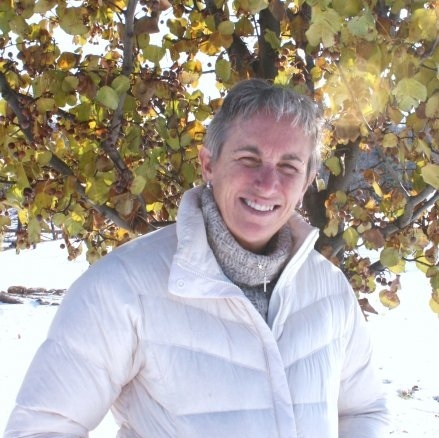 This year the scholarship was renamed in memory of Mindy Darst, to honor her many contributions to the industry and Zone 5. Breanna Mysyk was this year's winner of the USHJA Zone 5 Scholarship in memory of Mindy Darst. Breanna Mysyk displays her scholarship check with her mother and father. Saturday at the Kentucky National was the National Horse Show/ASPCA Maclay Regionals for Region 4. Eighty-nine riders competed for a spot on the list of riders that would make the cut to the finals at the National Horse Show. After additional testing following the flat phase, Caitlin Boyle from Hampshire, IL earned the Regional Championship. Sophie Simpson, Vivian Yowan and Vivian Ingram also made the work-off and a spot in the final four. The complete list of qualifiers can be found at www.nhs.org. Caitlin Boyle won the Region 4 NHS/ASPCA Maclay Championship. Committee chairs Diane Carney and Patrick Boyle have made education a priority in their zone. Both have arranged for many clinic opportunities including Candice King, George Morris, Archie Cox and a recently, a USEF Licensed Officials Judges clinic. The committee has also hosted Trainer Certification and Emerging Athlete Clinics as well. For more information on any Zone 5 programs, contact Christina Murphy at cmurphy@ushja.org, Patrick Boyle at showsno1@aol.com or Diane Carney at dtelluride@aol.com.